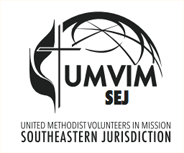 Every UMVIM team leader is encouraged to take the Team Leader Training course, either through their annual conference’s UMVIM coordinator or from the UMVIM, SEJ office. If you do not see your conference listed, please refer to our Conference UMVIM Coordinator page to email your coordinator directly. If your church would like to host a training session, please contact Susan Hunt at susan@awfumc.org. May 4, 2019. FUMC Oak Ridge, Oak Ridge, TN. Training will be held 10am - 3pm. For more information, contact Maxine or Bob Schultz, 865-719-4304 or 865-719-3230. To register for the training, click here. To request Team Leader Training, please contact Rev. Amanda Gordon at amandammumc@gmail.com. To request Team Leader Training, please contact Rev. Gary Baker at umvim@kyumc.org. To request Team Leader Training, please contact Lynette Brown at lynetteb@northsideumc.org. To learn more about upcoming Team Leader Trainings in the Virginia Conference, click here.